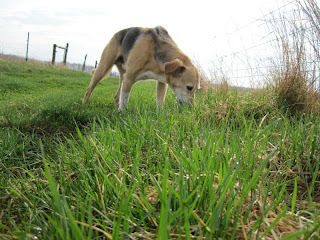 Here on our grass-based farm even the dog grazes. Always has. He's not quite a vegetarian, but he eats his share. 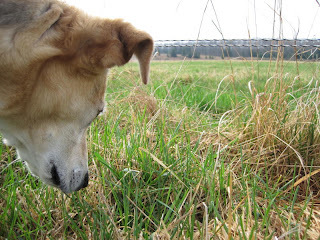 You can see how carefully he looks to find the best, juiciest blade of grass. Last year I determined to teach him not to join me in the field with our broilers. I didn't want them getting cozy with any canine only to march innocently up to a coyote or fox some day. Each day when we reached the fence I told him to wait. But he's a good farm dog who likes to be whereever I am, so he usually jumped the fence to join me as I went about my chores. After a few days of several reminders--his loyalty to me is strong--he waited at the fence when I asked him to. I didn't have any treats at hand, but there was grass all around. So I picked three fresh blades and gave them to him one by one. You never saw such excitement in a dog; a real bonanza! After that day he sat patiently waiting in a sea of grass for me to finish the chicken chores and give him his daily blade of grass.